I have a pretty autumn indie polish from you. This is another polish from Sindie Pop! Lacquer. I absolutely loved her fall collection. This is one of the other fall polishes I picked up last month when she released the collection. 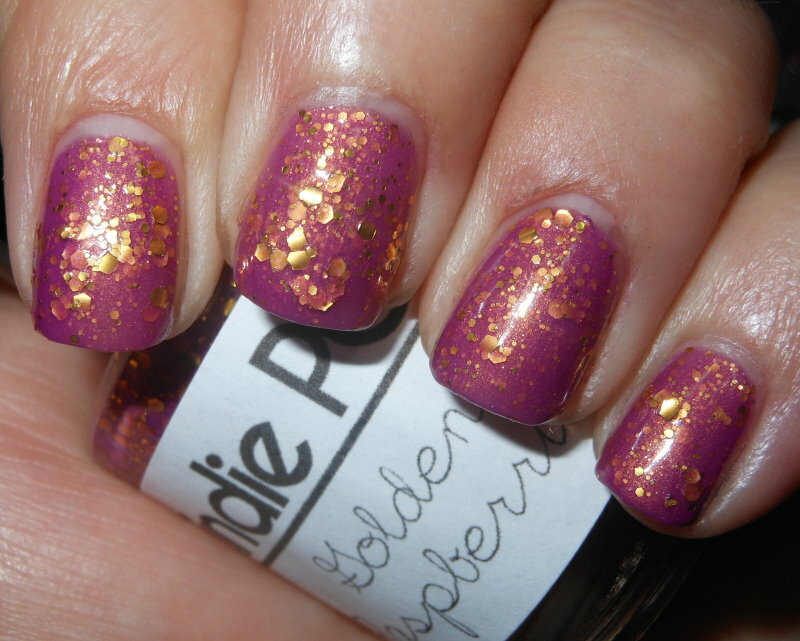 Golden Raspberries is a dusty rosy-mauve packed hex gold glitters in different sizes. I love this. You know I do. It has gold glitter! I love these colors together. This was the first color I saw from Sindie Pop! Lacquer's fall collection that let me know I would love this indie brand. It is a beautiful color combination that I have not seen yet. This was also 2 coats! Yes, 2 coats! This color is also so perfect for fall, and it's not even an expected fall nail polish shade either. So in love. I'm calling it a must have in my book! I purchased this from Sindie Pop! Lacquer's shop for $8.00. Be sure to like her Facebook page too! This is gorgeous! I love the mauve and gold combo of it! Oooh, I love this too! Love this on you Steph! Really pretty, I love this combo! I own a max factor mini polish that combines golden and mauvie rose, but of course no glitter in there, so not even similar to this beauty! Oh my gosh this is amazing! I love the colour combination. And only two coats...perfect! What a gorgeous colour combo! I love raspberry and gold together!! This is a winner!